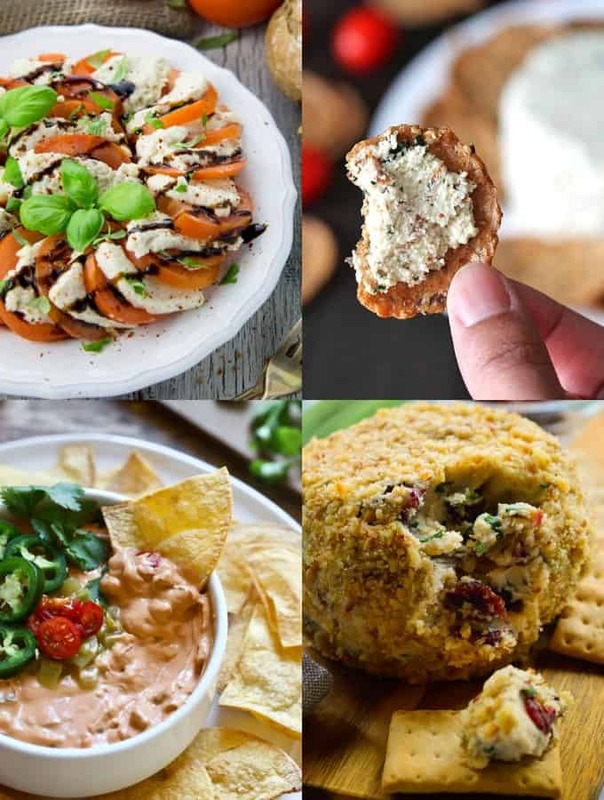 These 30 vegan cheese recipes taste so much like the real thing! It’s just incredible how delicious homemade vegan cheese can be! 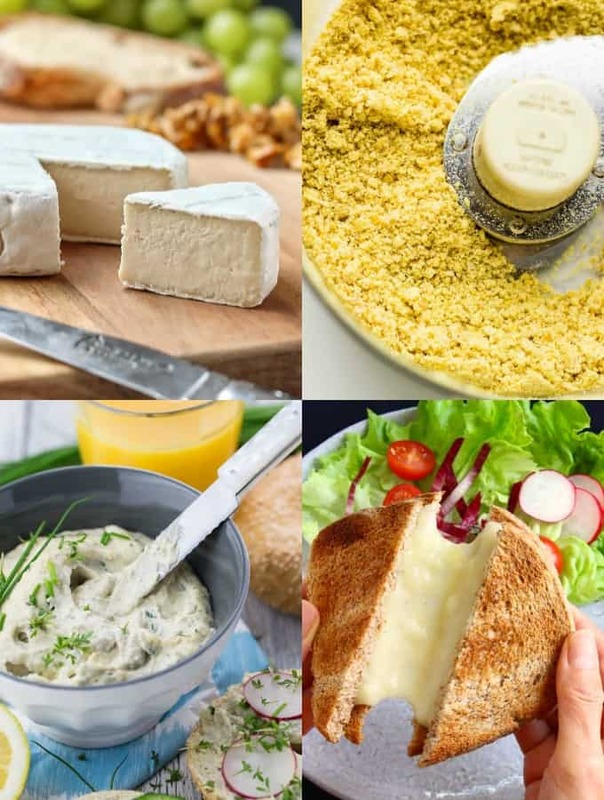 All of these vegan cheese alternatives are 100 % dairy-free and plant-based! 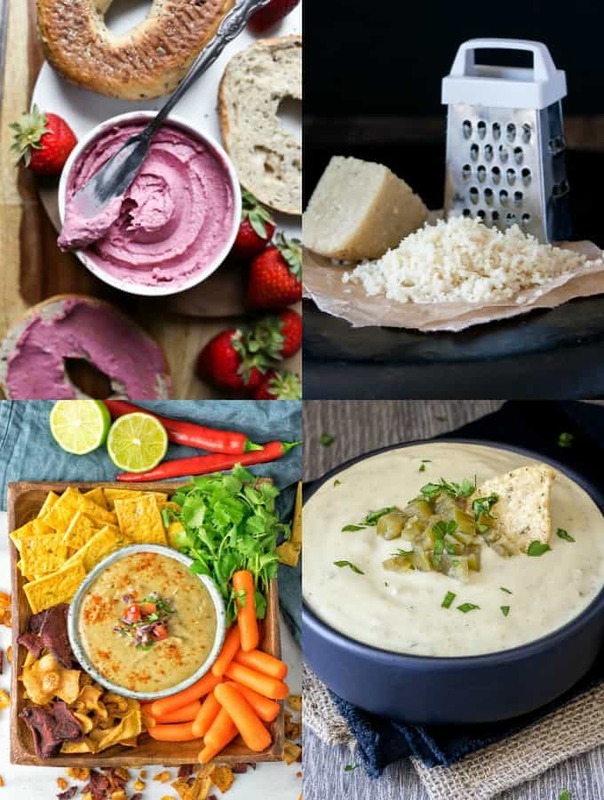 So ditch the dairy and try some of these non-dairy cheese recipes! I used to be a total cheese addict and I thought giving up cheese would be the hardest part about becoming vegan. But I was so wrong! Vegan cheese can actually be super delicious if you know how to prepare it! It might seem surprising to some people, but I’ve heard this question so many times. No, vegans don’t eat cheese as they avoid any kind of animal products. Unlike vegetarians who are okay with cheese, milk, and eggs, vegans don’t consume dairy products. This means they avoid cheese as well as butter and milk. However, there are a lot of vegan cheese alternatives that are made of nuts or soy instead of cow’s milk. You can find them in many regular supermarkets in the refrigerated vegetarian and vegan section. Vegan cheese is a cheese alternative for people who are vegan and want to avoid animal products. It’s also great for people who are lactose-intolerant. 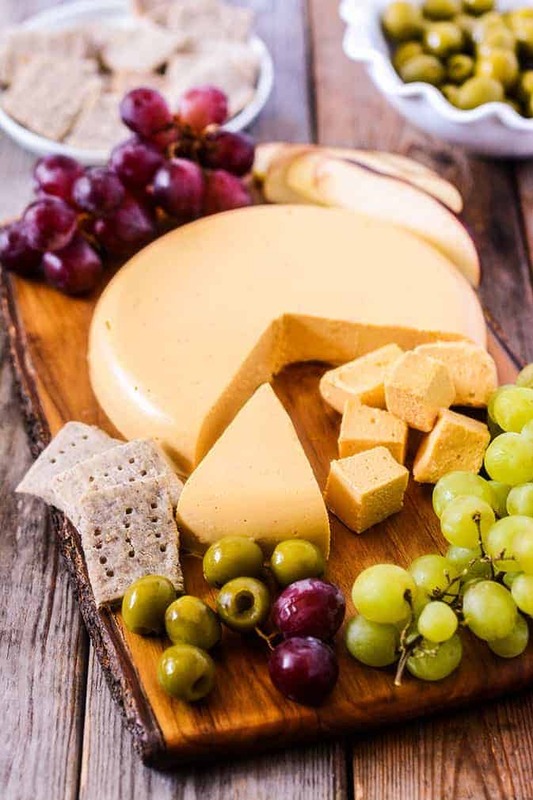 Instead of cow’s or goat’s milk, vegan cheese is usually made of different kind of nuts, plant-based milk, soy, or nutritional yeast to just name a few ingredients. 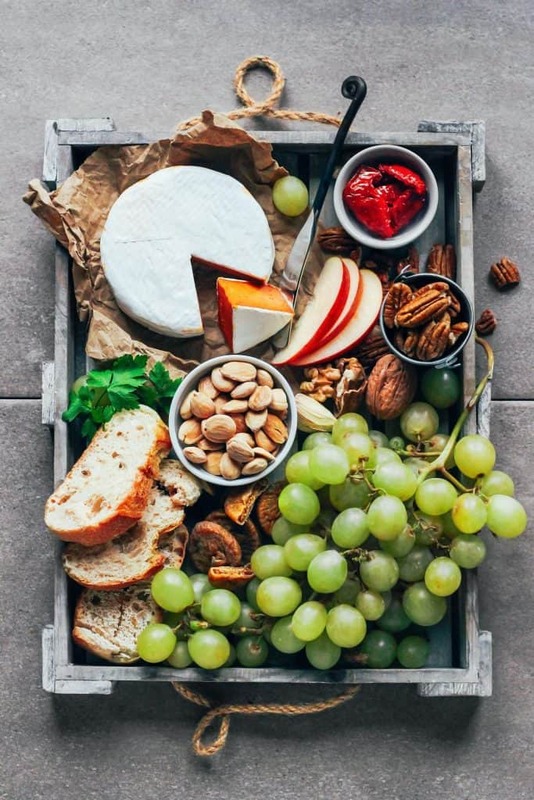 Cashews and almonds are the most popular nuts for non-dairy cheese. Vegan cheese has been around since the 1980s. 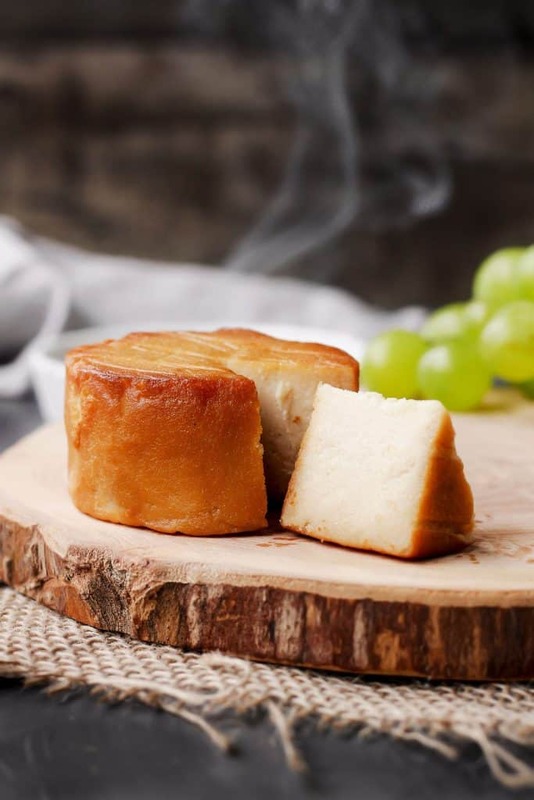 However, its quality and taste improved significantly over the last few years as veganism became more popular and the demand for vegan cheese grew. While vegan cheese in the beginning tasted very waxy and artificial, it can now taste very similar to regular cheese. Some of the vegan cheese alternatives even melt and stretch like real cheese. Unfortunately, many store-bought vegan cheeses have a very long ingredient list. So it might sometimes be better and more tasty to make your own vegan cheese at home. What Is Vegan Cheese Made Out Of? The preparation of vegan cheese depends a lot on what kind of cheese you want to make. For most vegan cheese recipes you need a very good high speed blender or a food processor. I love my Vitamix and I use it all the time to make dairy-free cheese. You might also need a cheese cloth or a nut milk bag. A simple vegan cream cheese is pretty easy to make by combining soaked nuts, water, and a squeeze of lemon juice in a blender. Just blend it until you got a smooth cream. You can also add nutritional yeast for a cheesier flavor as well as garlic and herbs. For vegan Parmesan cheese and creamy vegan cheese sauces you also need a good blender. They’re both very easy to make and you can store the vegan Parmesan cheese in the fridge for a couple of weeks. 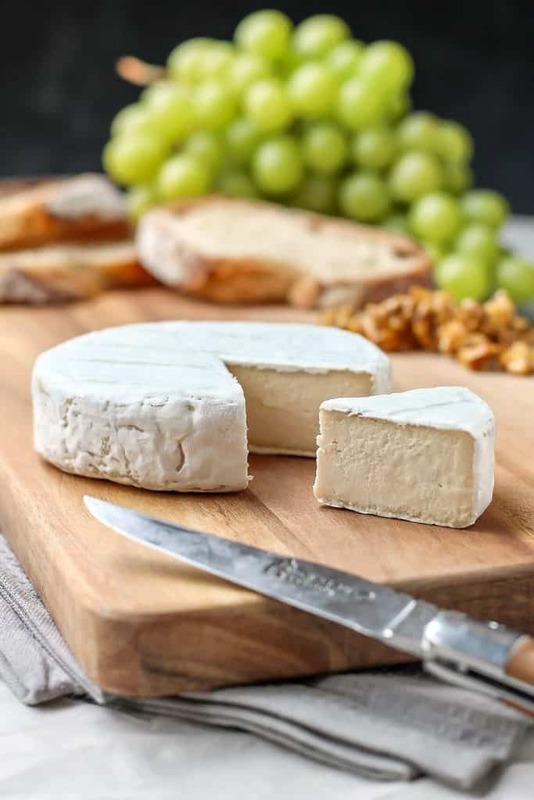 Making vegan grateable cheese or soft cheese with a rind of white mold like Brie or Camembert is much more difficult and it requires more time. However, with a bit of patience, knowledge, and work you can make stunning vegan ripped soft cheese. And even blue cheese! Nut cheese is my favorite kind of cheese! Cashews are a common base for plant-based cheese. They can be blended into rich sauces and they’re perfect for mild-flavored sauces like vegan Alfredo. They’re also awesome for vegan cream cheese, vegan Parmesan cheese, and even vegan cottage cheese. Other popular nuts for vegan cheese recipes are almonds and macadamias. You usually need to pre-soak the nuts before making vegan cheese. Besides, you need a very good blender to be able to get the right texture. It’s very easy to find vegan cheese in grocery stores these days. Just look in the refrigerated section where the vegan and vegetarian meat alternatives are. Whole Foods Market and other organic grocery stores often even have a bigger variety of vegan cheese than regular grocery stores. Popular brands in the U.S. and Canada are Daiya, Follow Your Heart, Chao Cheese by Field Roast, and Toffuti. I can also recommend Kite Hill cheese, which is made of cultured almond milk. Trader Joe’s also has an amazing vegan cream cheese. If you can’t find the plant-based cheese alternatives in the store, you could check out the brand’s store finder online or even have them delivered to you. Let’s get the yumminess started!! Just click on the link below each photo to see the recipe. 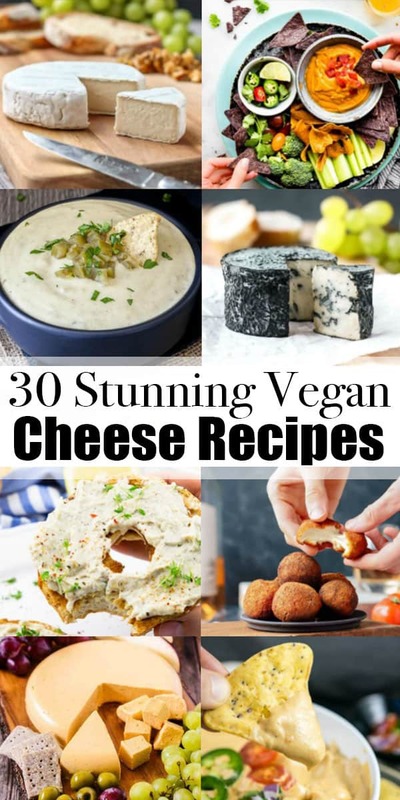 Vegan Cheese Recipes – 30 Cheese Alternatives You Have To Try! Thomas from Full of Plants is a real genius at making vegan cheese. I mean just look at this vegan aged camembert cheese! It looks stunningly real and Thomas says it just tastes like really camembert as well. And can you believe how good this white rind looks? 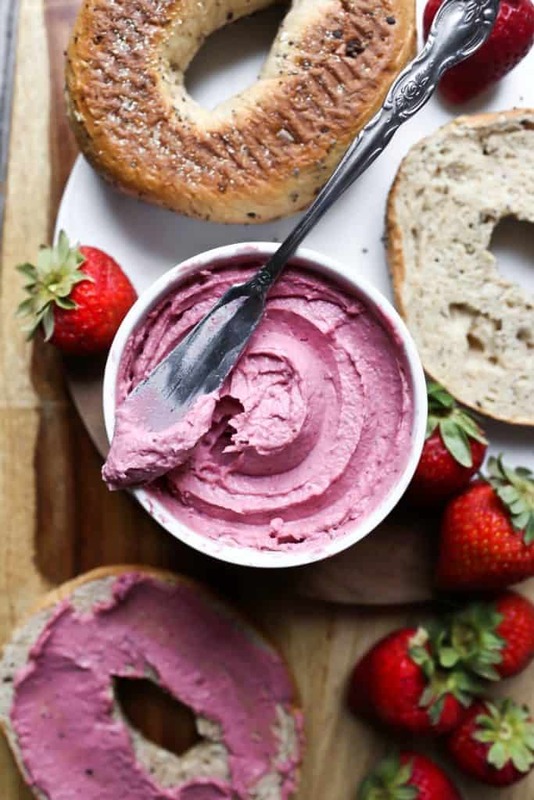 This vegan cream cheese with cashews is one of my favorite vegan cheese recipes. It’s super easy to make, incredibly creamy, and so garlicky. 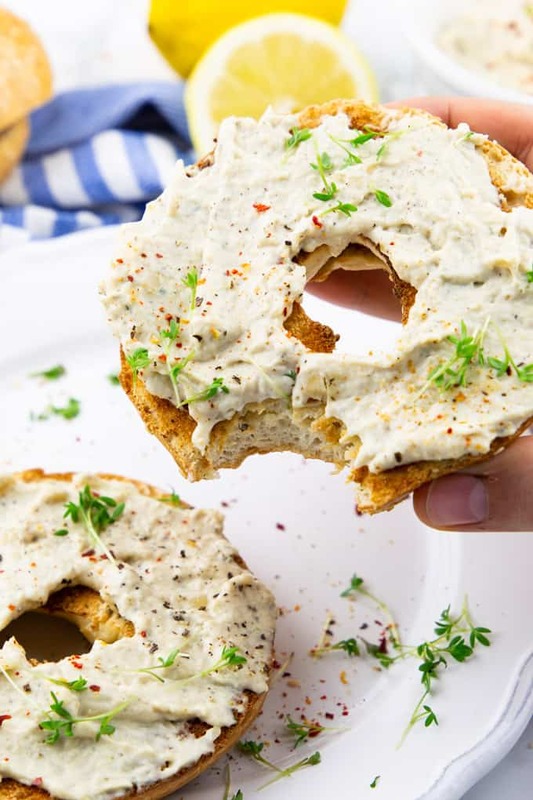 Kiss your dairy products goodbye and say hello to this delicious vegan cream cheese cheese alternative with garlic and fresh herbs! 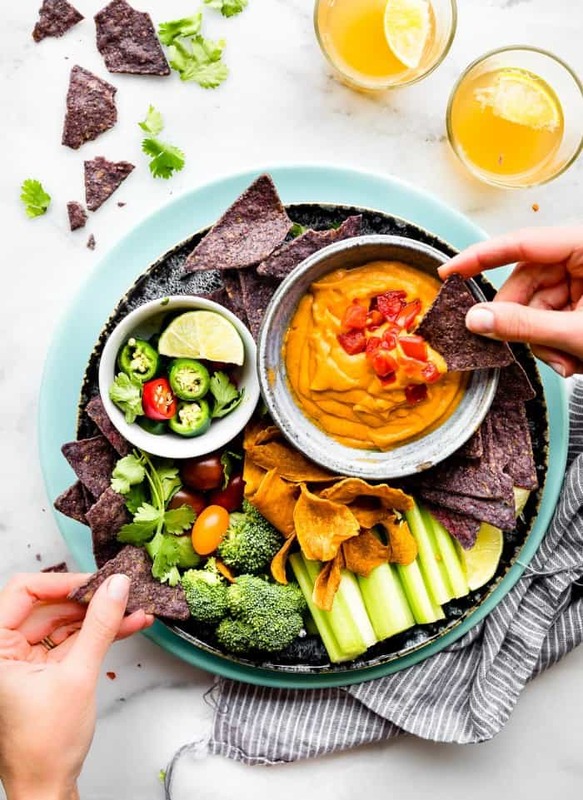 I wish I could just dip a nacho into that vegan queso by Lindsay from Cotter Crunch! 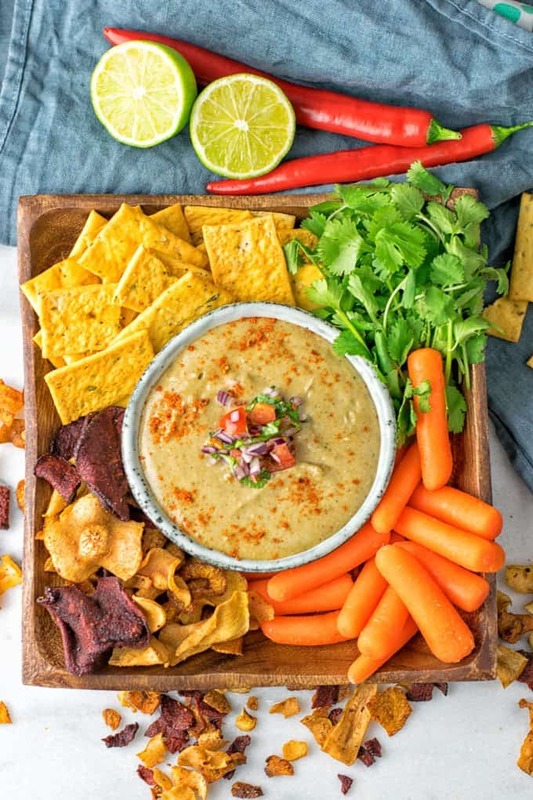 Lindsay used fresh vegetables and a hint of Tex-Mex spices to make this vegan cheesy dip. Perfect for the whole family! 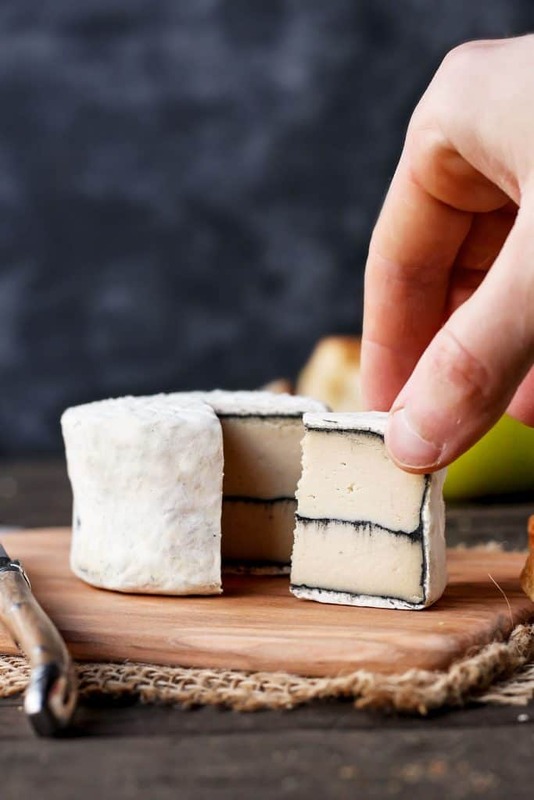 This vegan hickory smoked aged cheese is another great cheese creation by Thomas from Full of Plants. The coolest thing is that it’s real smoked over hickory wood chips. It’s smoky, buttery, and packed with flavor! I’m so excited about this vegan mozzarella! The recipe is super simple and you only need four very healthy ingredients. 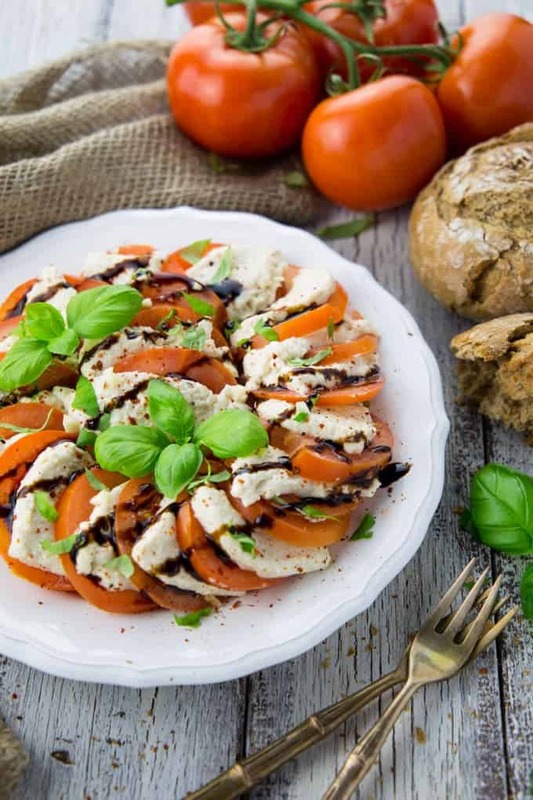 It’s best served in a caprese salad with tomatoes, basil, and balsamic vinegar! 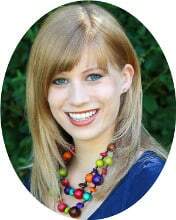 Are you hosting a party? Then this vegan cheddar cheese by Michelle from Healthier Steps will make a perfect appetizer. It’s smooth, creamy, and sharp. And I think it will even impress the pickiest eater! 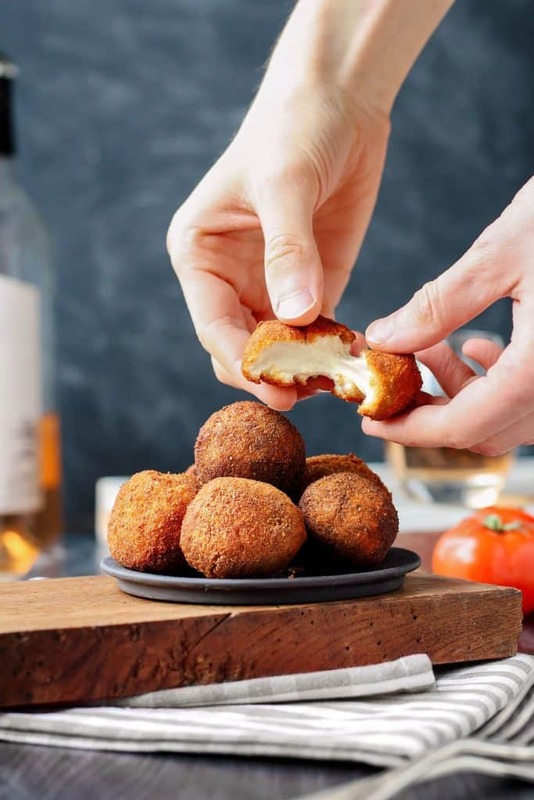 Yes, you can actually make dairy-free cheese out of cauliflower! 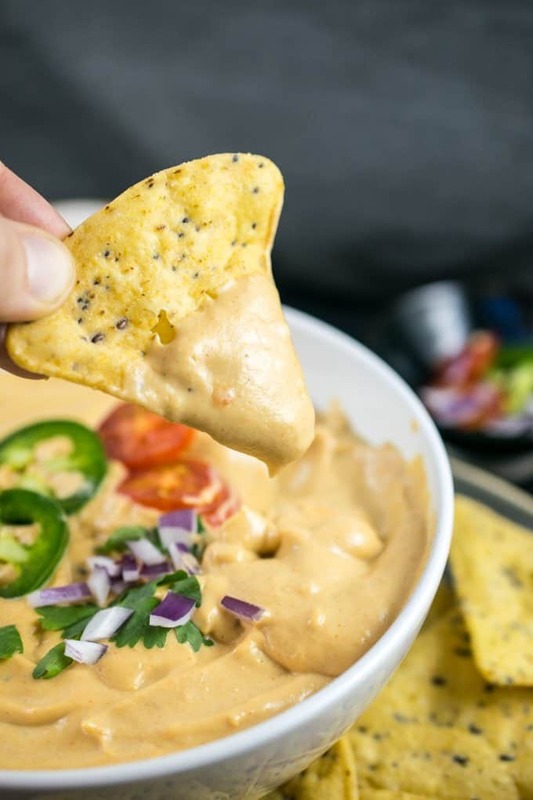 This vegan cauliflower queso by Shannon from Yup It’s Vegan is the perfect proof! It’s silky, creamy, and smooth! Shannon used a combination of cauliflower and cashews to make this vegan queso. 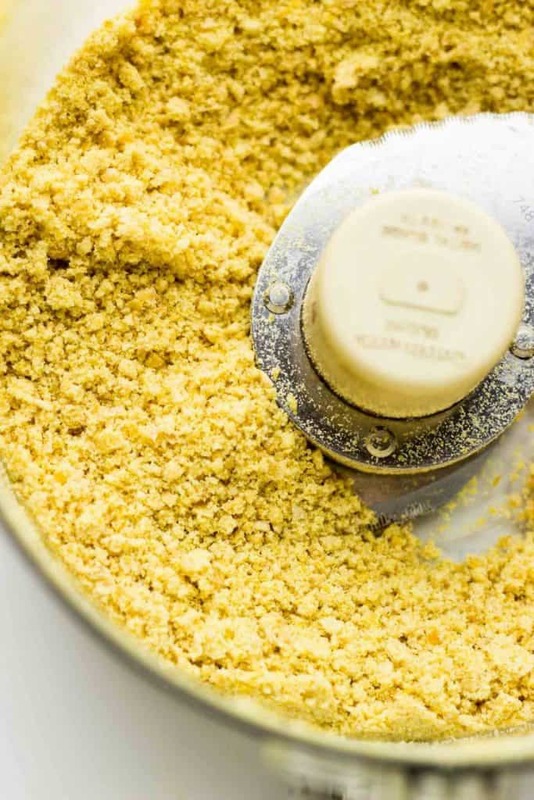 And of course we needed a recipe for vegan Parmesan cheese in this roundup. As you might know, it’s often made with cashews as a base. This vegan Parmesan cheese by Joyce from Light Orange Bean is, however, completely nut-free. 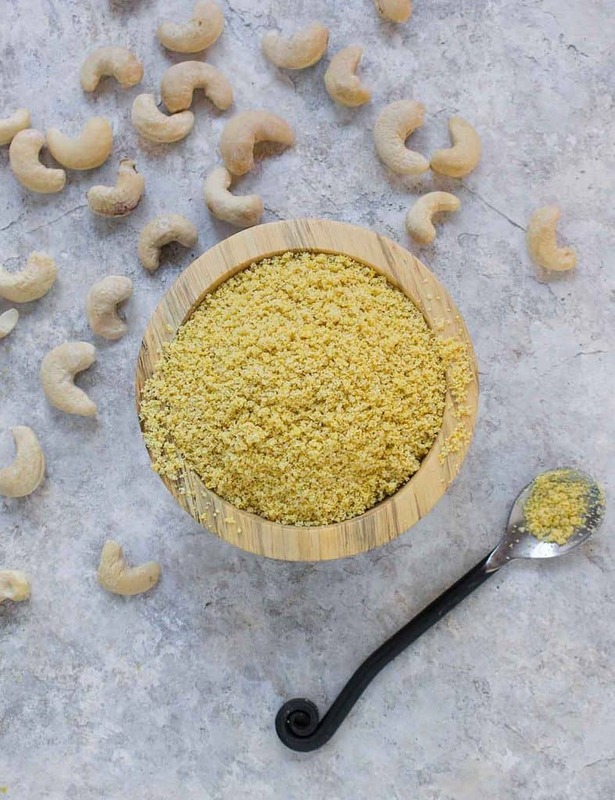 Instead of cashews, Joyce used chickpeas for her vegan Parmesan cheese. The base of this vegan feta cheese is extra firm tofu. The tofu is very close in consistency with feta cheese, so it is the perfect ingredient for a dairy-free alternative to feta cheese. 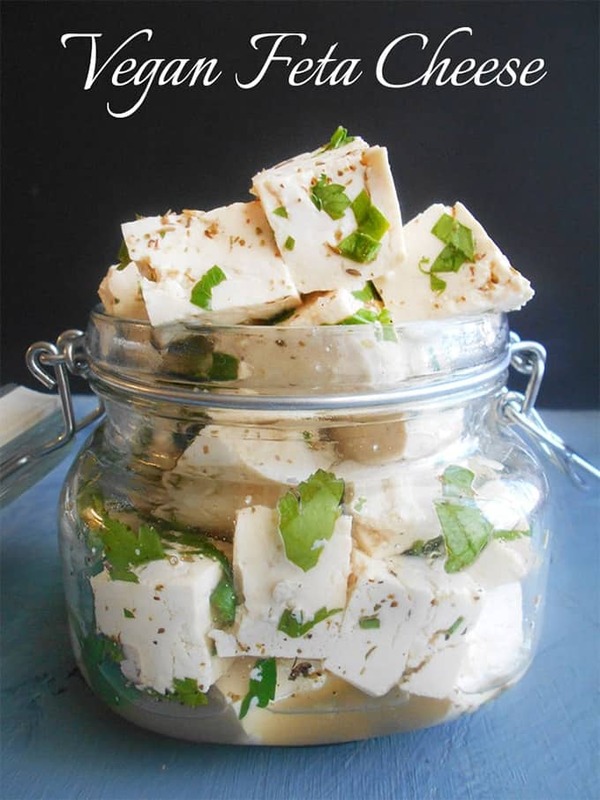 You can use this vegan feta cheese for all kinds of dishes and salads. Doesn’t this vegan blue cheese look so much like the real one? Thomas from Full of Plants also says it tastes a lot like the real thing. It’s creamy, sharp, and strong. And you need only four ingredients to make it! 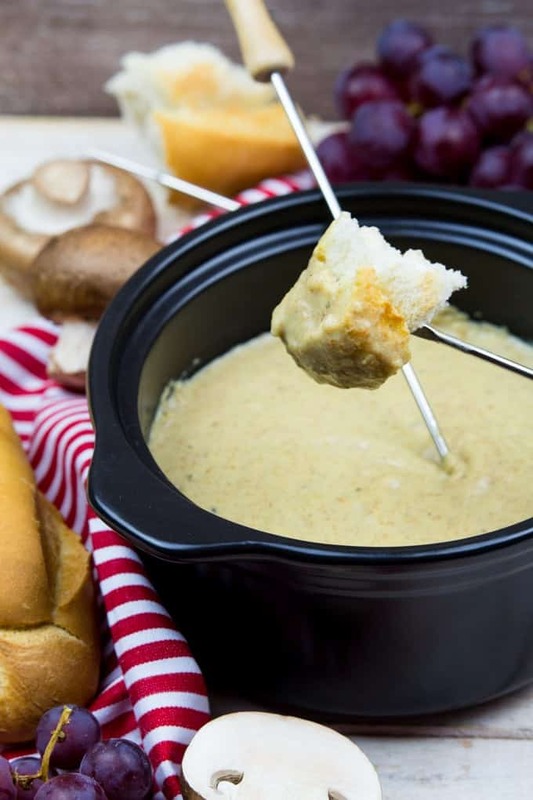 This vegan cheese fondue is a great and fun way to gather friends and family. It’s nut-free, extremely creamy, wine-infused, and ready in only 10 minutes! You used to love cheese sticks but now you’re vegan? No problem! These vegan cheese sticks by Bianca from Elephantastic Vegan are the perfect alternative! 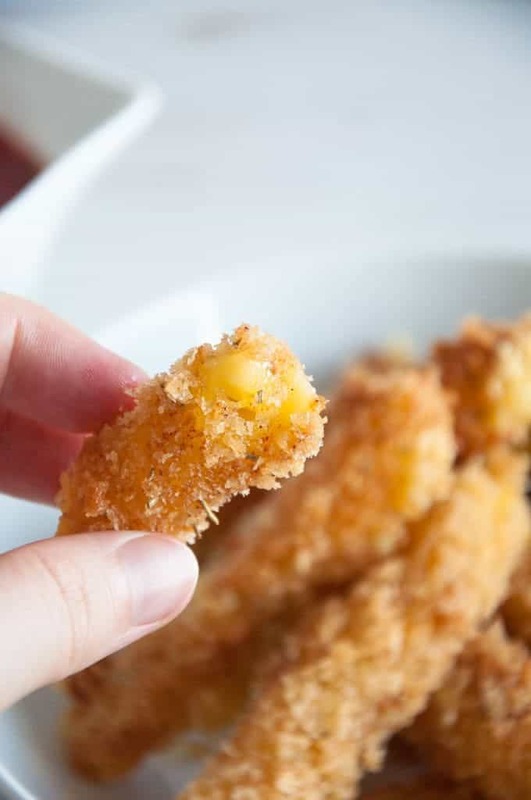 They’re crispy on the outside and cheesy and gooey on the inside. You need only five ingredients for this Mexican cheese dip by Florian from Contentedness Cooking. It’s vegan as well as gluten-free. And it’s really easy to make! We even got vegan fried got cheese balls in this roundup! It’s another dairy-free cheese recipe by Thomas from Full of Plants. They’re melty on the inside and crispy on the outside. And they’re pretty easy to make! 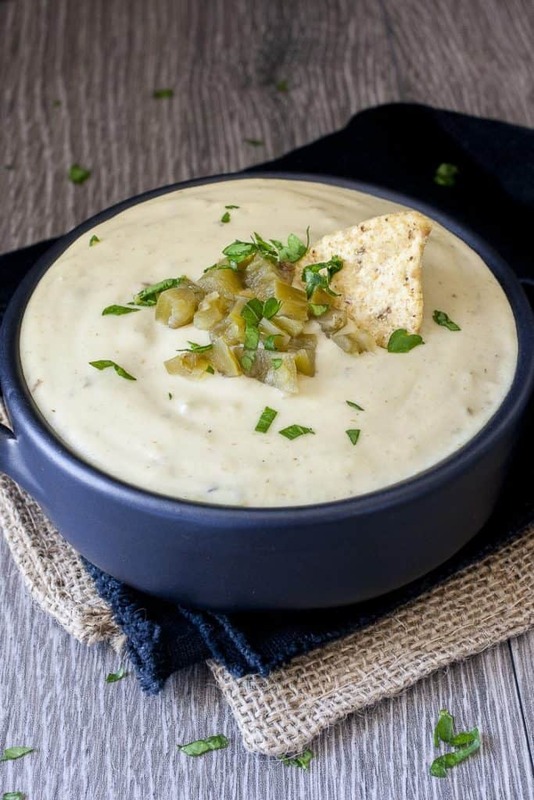 Get your chips ready for this delicious-looking queso blanco by Sophia from Veggies Don’t Bite. Doesn’t it look super delicious and creamy? And the best thing is that it’s made with whole foods! 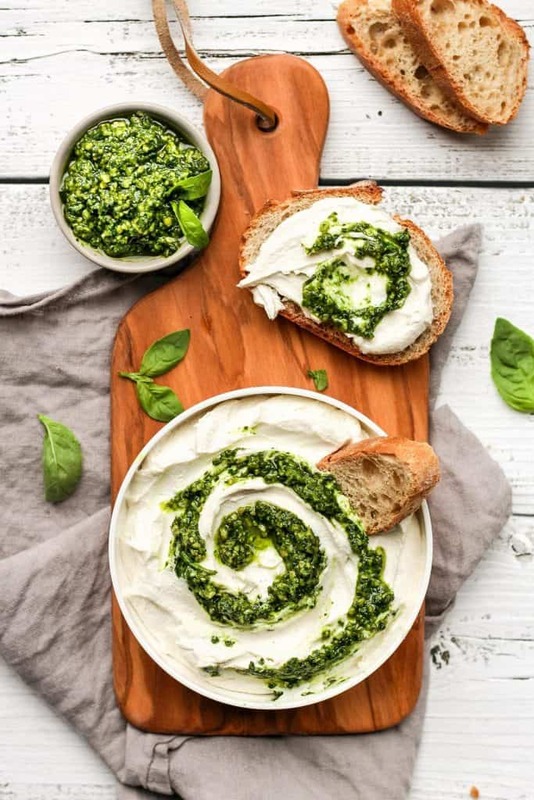 Vegan cream cheese is already super delicious but it gets even better with a pesto swirl! Yummy! This recipe by Thomas from Full of Plants is super easy to make. It’s a great dip with roasted vegetables or as a spread on toast or bagels. 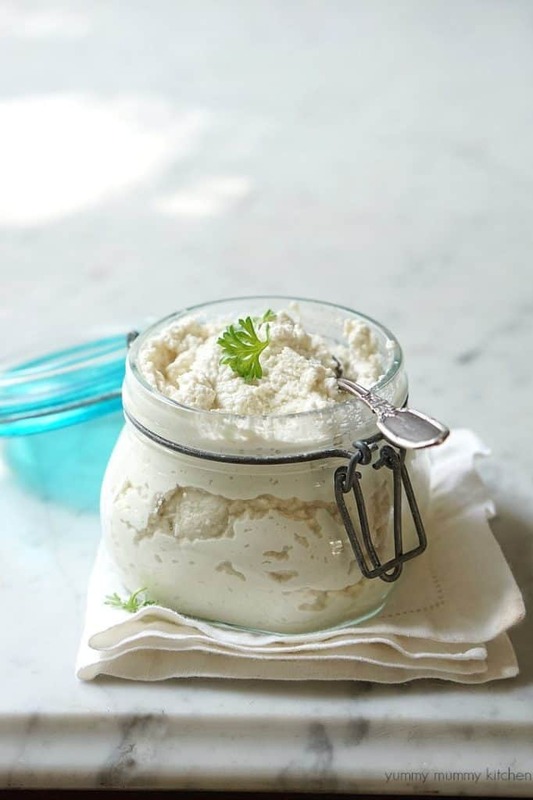 This almond based vegan ricotta cheese by Marina from Yummy Mummy Kitchen is super easy to make. You can use it to make lasagna or other Italian recipes. Or you could even spread it on crackers. Cream cheese and strawberries is such a great combination! Brandi from The Vegan 8 made a great vegan version for which she used just 5 ingredients: freeze-dried strawberries, cashew butter, yogurt, and lemon juice. It’s thick and super creamy! Who can say no to a delicious vegan grilled cheese sandwich? It’s the perfect comfort food! 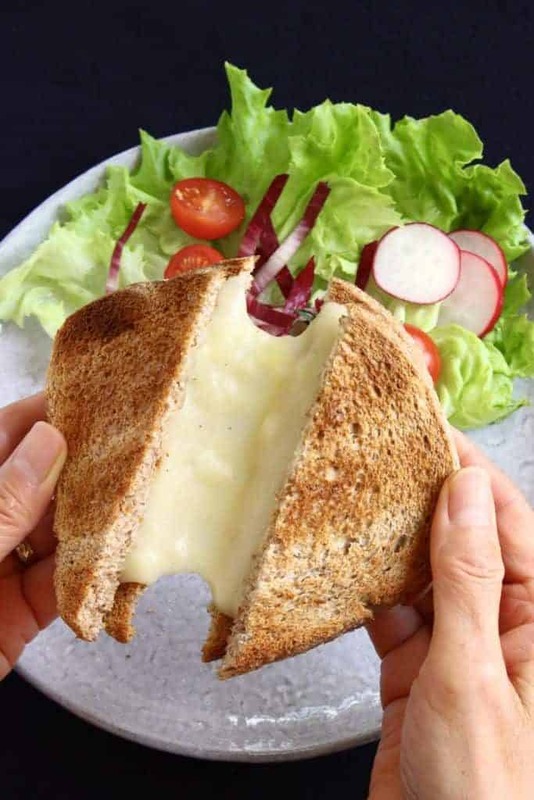 Doesn’t this stretchy melty grilled cheese by Rhian from Rhian’s Recipes look super good? This is another great cheese recipe by Thomas from Full of Plants. If you like Thomas’ vegan camembert, you should this version with sun-fried tomatoes. It’s garlicky and so creamy! 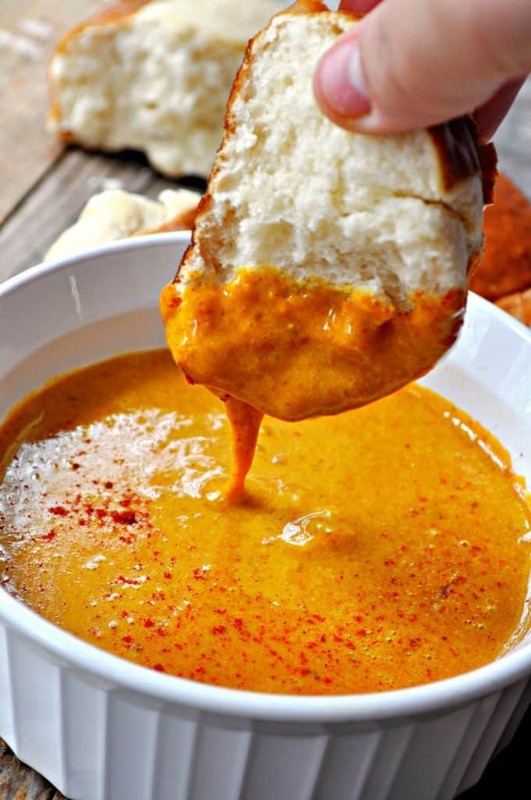 This vegan beer cheese dip by Lauren from Rabbit and Wolves makes such a delicious dip! It’s creamy, melty, and smooth. And great news for people with nut allergies: Lauren didn’t use any cashews for this creamy dip and you can replace the almond milk with any other plant-based milk. 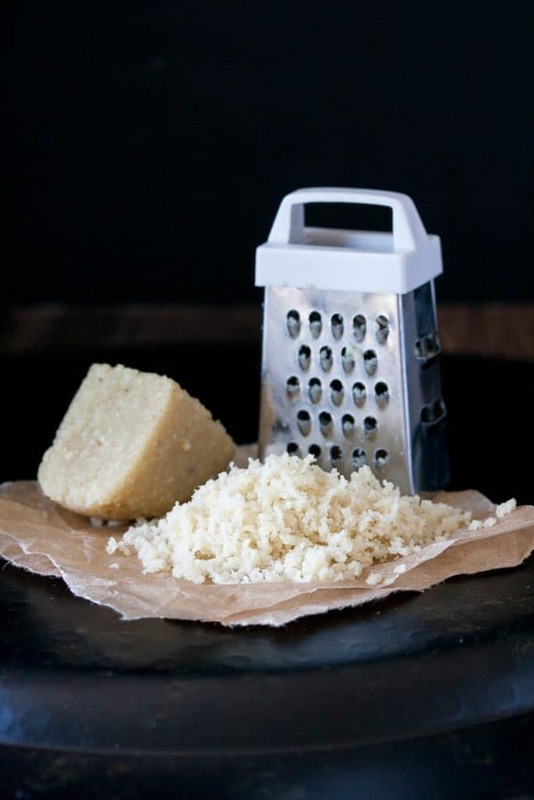 How cute does this vegan parmesan cheese with the tiny grater by Sophia from Veggies Don’t Bite look? And the best thing is it’s grateable, which is pretty rare for vegan Parmesan cheese! Yummy! 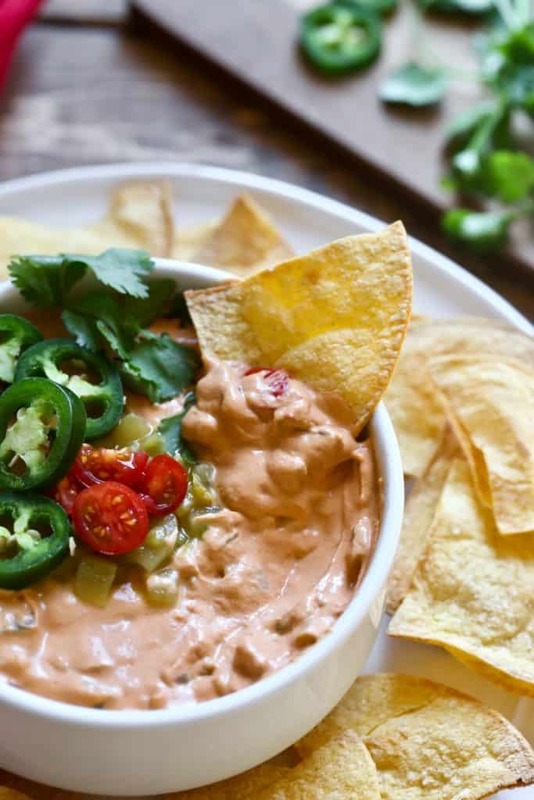 This vegan queso by Brandi from The Vegan 8 is just perfect for your next party. Or for a lazy night in front of the TV! It’s dairy-free, oil-free, and super delicious! 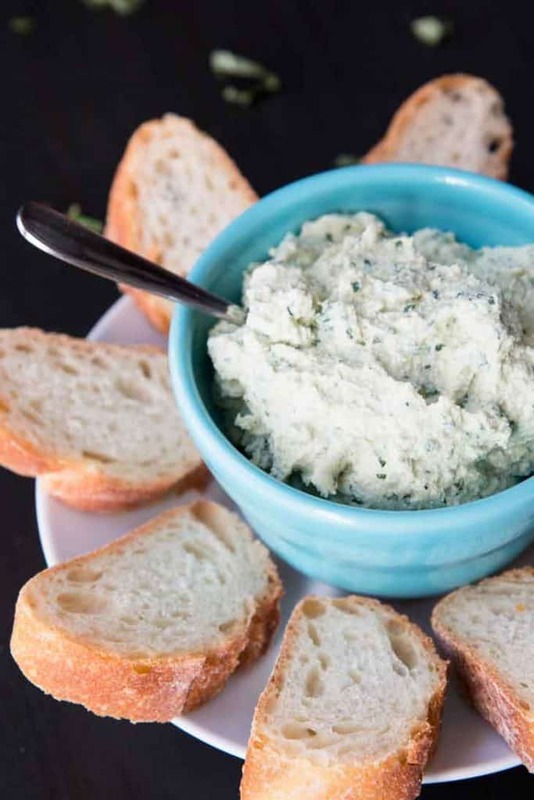 You can use this garlic herb vegan almond cheese spread by Gwen from Delightful Adventures in many ways. It’s great on crackers, as a dip for veggie sticks, or on a sandwich. This vegan ash ripened camembert is another great cheese creation by Thomas from Full of Plants. 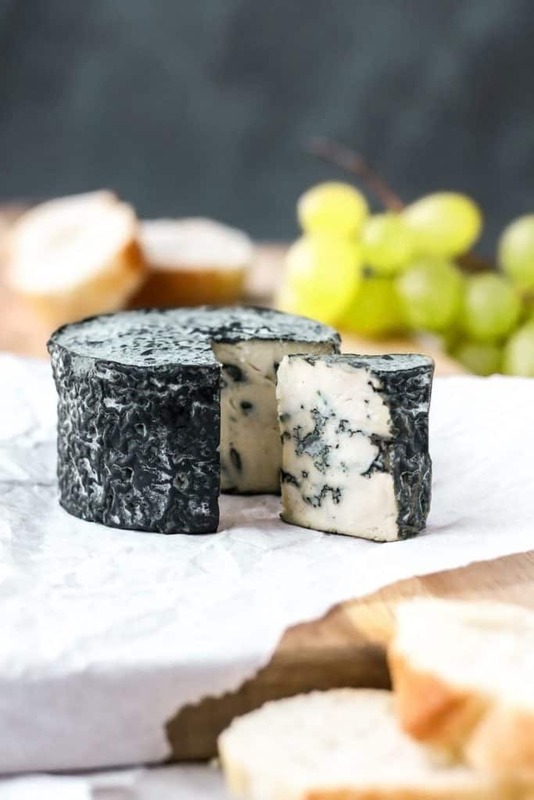 It consists of an aged camembert cheese that is coated with black ash and covered with white mold. Sounds pretty fancy, right? 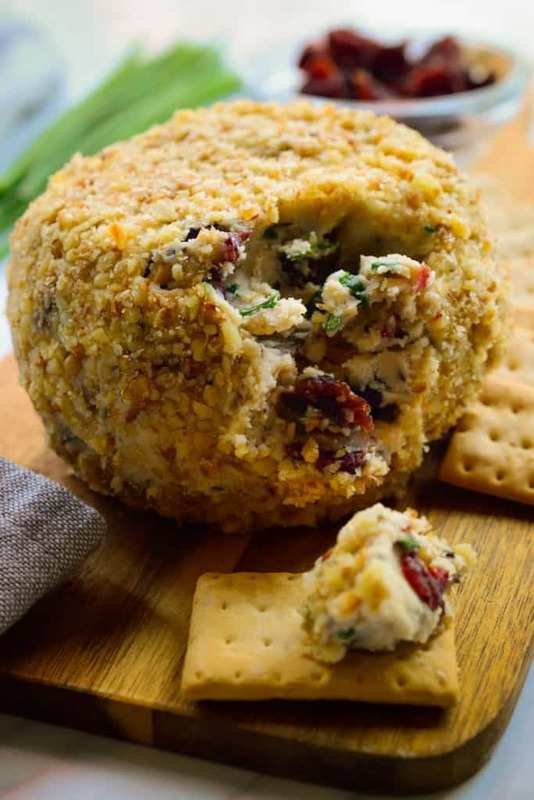 This cranberry rosemary cheese ball by Melissa from the Stingy Vegan is perfect if you’re looking for a fancy appetizer. Besides, it’s also perfect for the holidays. It’s deliciously sweet and savory and is great with crackers. 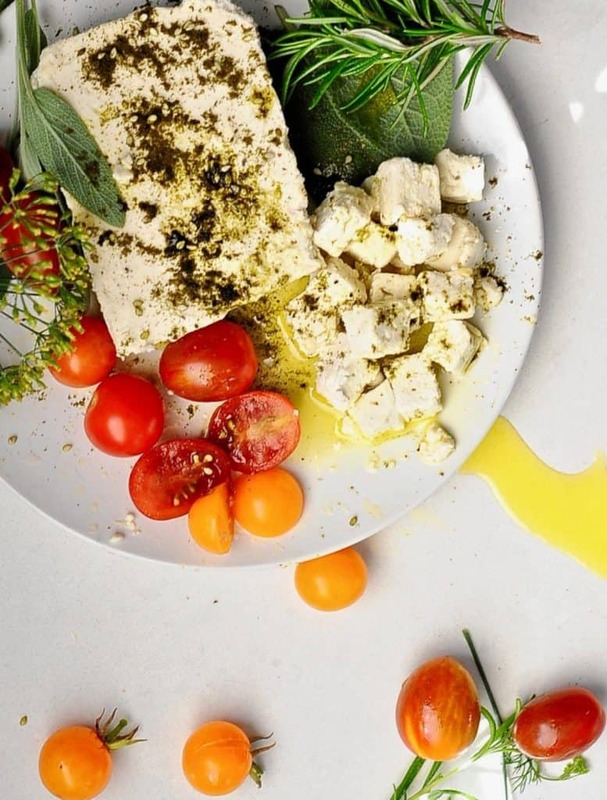 This herb marinated feta by Hanne from Sunny Side Hanne is great for salads. Especially in the summer! Or you could also spread it on sandwiches. 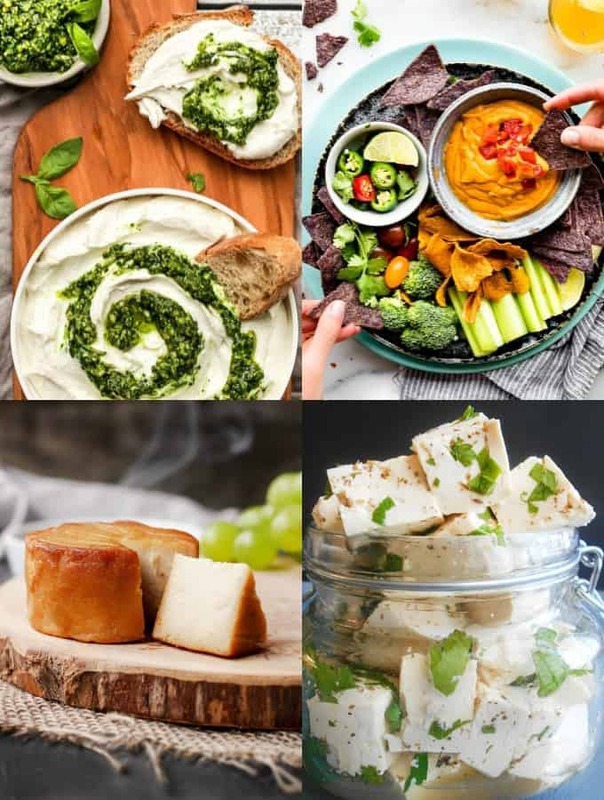 We already have another vegan feta cheese recipe in this roundup, but Hanne didn’t use tofu for her recipe but almonds. 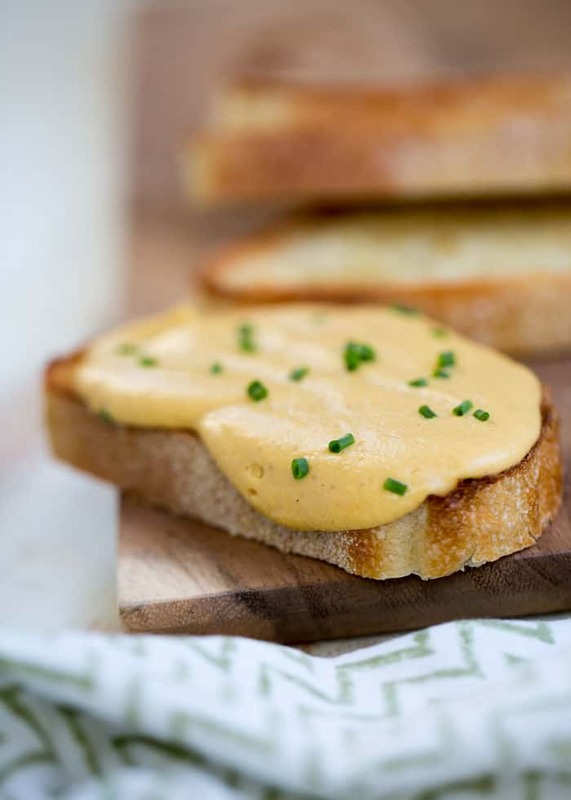 Doesn’t this butternut Welsh rarebit by Kare from Kitchen Treaty look super comforting? Kare used butternut squash and cashews for this simple cheese sauce. Pasta dishes are just so much better with Parmesan! And luckily it’s pretty easy to make vegan Parmesan. This cashew Parmesan by Karen from Crave Veggies is a great example! 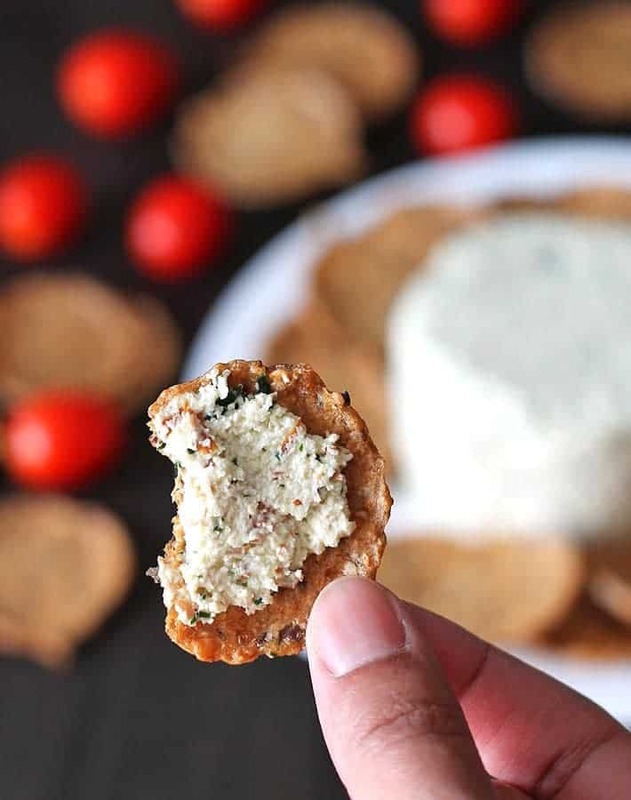 This vegan garlic basil ricotta cheese spread by Anjali from Vegetarian Gastronomy takes just 10 minutes to make! It’s great with crackers, spread on a sandwich, or in Italien dishes. I hope you enjoy these dairy-free cheese recipes as much as I do! Don’t forget to pin or share this post so you have these recipes ready when you need them! If you give any of these recipes a try, I’d love to know what you think about it. Just leave me a comment below. Your comments really make my day! Thanks Sina for sharing my recipe! Will promote! love this post! 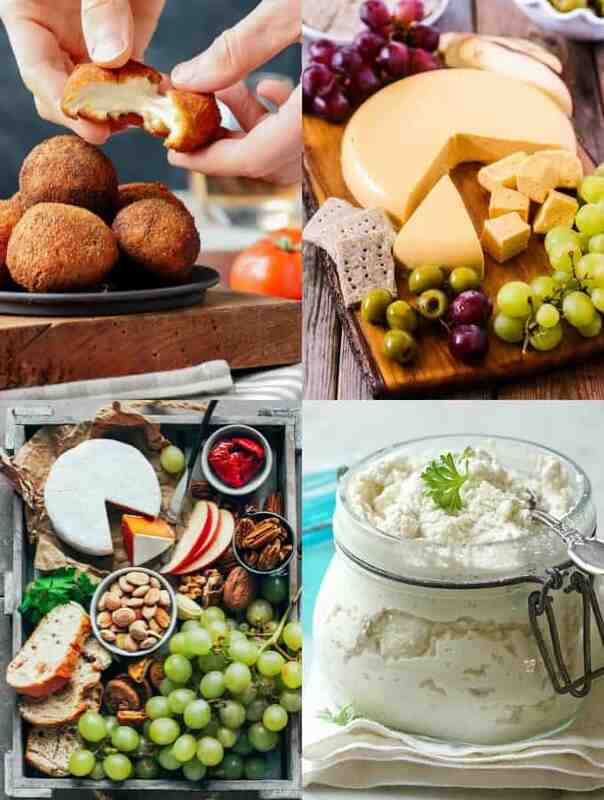 I’m in Israel right now and an old friend was telling me that on the holiday Shavuot (which features lots of cheese dishes) that she wants to make and serve a vegan cheese platter. She asked me for some recipes and I was so happy to be able to direct her to this round up. P.S. I really include being included. I recently became a vegan and so appreciate your blog and these cheese alternatives. They all look delicious! 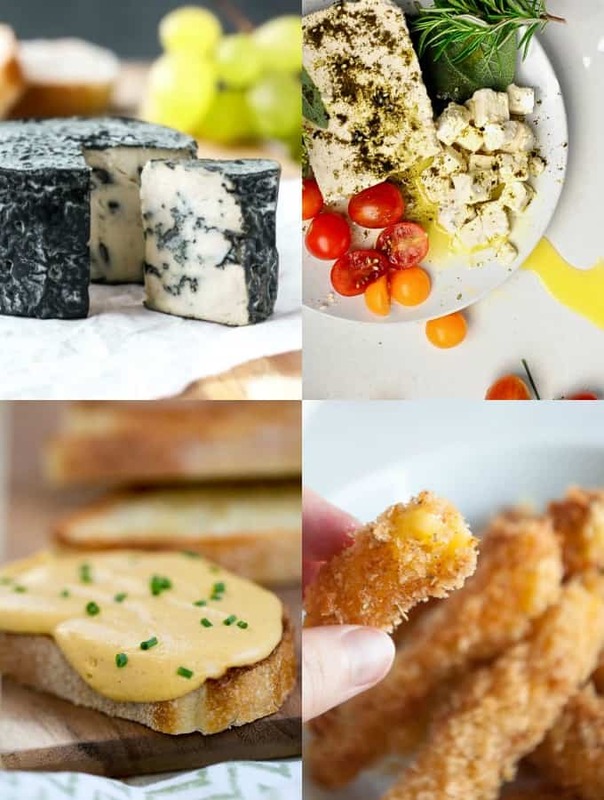 Great bunch of recipes, trying to go dairy free, but i really love cheese, do you highly recommend any certain brands that really tastes like cheese?. Daiya is great for melting (like making pizzas or mac and cheese), Chao is great for cold sandwiches or grilled ccheese, Follow Your Heart has a great Parmesan cheese, and Miyoko has some incredible hard and soft cheeses that pair amazing with crackers. If you’re looking for a good cream cheese, Kite Hill would be the best way to go. Hope that Helps!